The 2018 Mt. Wilson Trail Race will be held on May 26, 2018. Registration is now closed. Click here for coverage of the 2016 race. 8.6 mile course, begins and ends on pavement, in between it’s a dirt path no more than 3 feet wide. Elevation gain of more than 2,100 feet. Turnaround point is at Orchard Camp, 4.3 miles from race start. Much of the race is on the Mt. Wilson Trail, with occasional vertical drop-offs of several hundred feet. Emergency support is stationed along the course to provide aid, if needed. Boy Scout and Cub Scout troops provide water at two locations, the 2.3 and the 4.3 (turnaround) mile marks. The 107th anniversary of the first running of the Mount Wilson Trail Race will be held at 7:30A on Saturday, May 30, 2015. This annual event attracts runners from Sierra Madre, the surrounding communities, and even some from out of state! The 2015 MWTR will feature many activities and events on both Friday, May 29 and Saturday May 30, 2015. Activities include a kids run and art show, beer garden, community and sponsor booths, souvenirs, music, and much more. Family, friends, and fans are encouraged to stop by and cheer on the runners, enjoy the MWTR activities, and be surrounded by the festive atmosphere! See below the links to the archives for event schedule. 7 Comments on "Trail Race"
Winner of Kids’ Fun Run T-shirt Design Contest was anounced?? How do I get on this years waiting list? http://www.cityofsierramadre.com/onlineregistration, use your Active.com account to sign up. Just run it un-registered. Know can keep you out from running along with. You just dont get a number or all the stuff by registering. Well, Sam, that’s a little irresponsible, since the trail can accommodate only so many runners in an intense race like this. What if 200 “bandits” showed up on race day? So, Sam, think about it, okay? Hi- is it too late to register for this race? Thank you for your help. The race sold out in just a few hours this year, however, I believe you can still get on the waiting list, and I know that dozens of people on the waiting list got contacted last year. 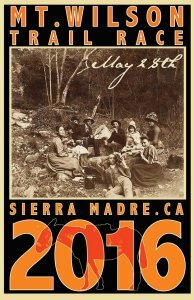 Go to http://www.CityofSierraMadre.com to register.